Do you feel trapped at home with your nursing baby out of fear that he might start one of those screaming attacks that means he’s hungry? Are your older children climbing the walls from being locked indoors? Say goodbye to spending your days indoors; go out and explore the world. With the Bebe au Lait Nursing Covers, you can nurse discreetly while out and about. You can now be calm going to the park knowing that you can just pull your nursing cover out of your diaper bag and sit down on a nearby bench to nurse your baby. They fold up so easily, it barely takes up any space! The rigid neckline is unique as it allows for ventilation, as well as direct eye contact with the baby. It’s also very durable and will keep its shape after being washed. Made out of 100% cotton, the Nursing Cover has multi-use: It can be used as a nursing cover, a blanket, or even a sunshade to protect your baby’s fragile skin from harmful UV rays. It’s machine washable so no need to worry if baby spits up! It has 2 terrycloth internal pockets to store tissues, nursing pads, pacifiers or whatever small item you may need. With the generous sizing of this nursing cover, you can nurse calmly knowing you are fully covered. Bebe au Lait created the safest and highest-quality nursing covers complying with more stringent international standards. With lots of beautiful patterns to choose from, the award winning Bebe au Lait Nursing Covers are a ‘Mommy Must-Have’. 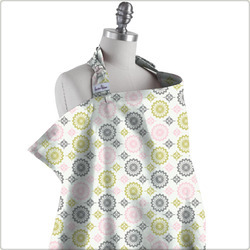 Check out all the beautiful patterns for the Bebe au Lait Nursing Covers that we have to offer!